That song often comes to mind while I'm on a hike with my family. I really feel like this is such a joyful summer. 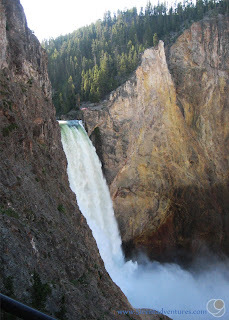 I'm so glad that we could all have this chance to live here in Yellowstone. One of my favorite things about being here is to come home from work and go on a hike as soon as we are done with dinner. We don't have to worry about a long car ride, or packing for an overnight trip - we are already living in the middle of a vacation. It's great. 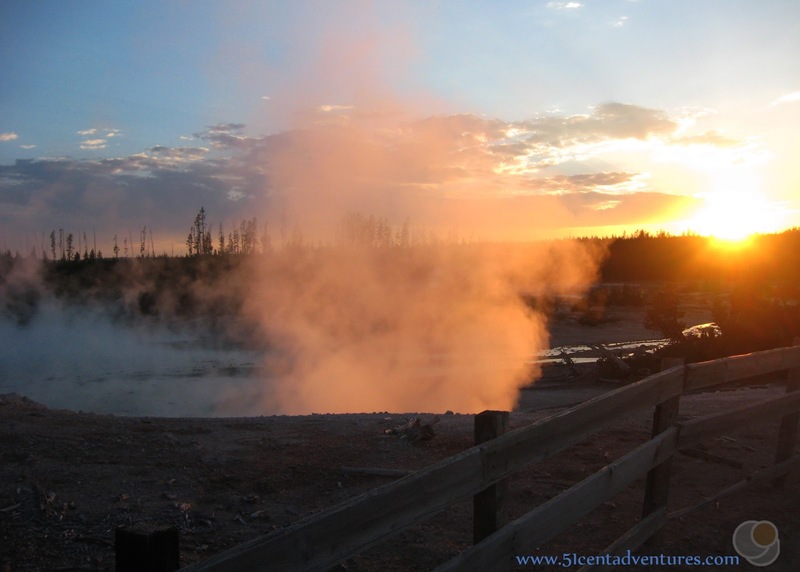 A few nights ago we decided to try Uncle Tom's Trail on the South Rim of the Grand Canyon of the Yellowstone River. 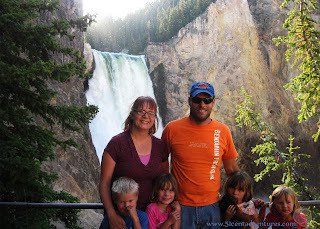 We've been on just about every trail in the Canyon rea, but I wasn't sure if we would ever do Uncle Tom's Trail. That's because the trail involves 328 steps down to the bottom. 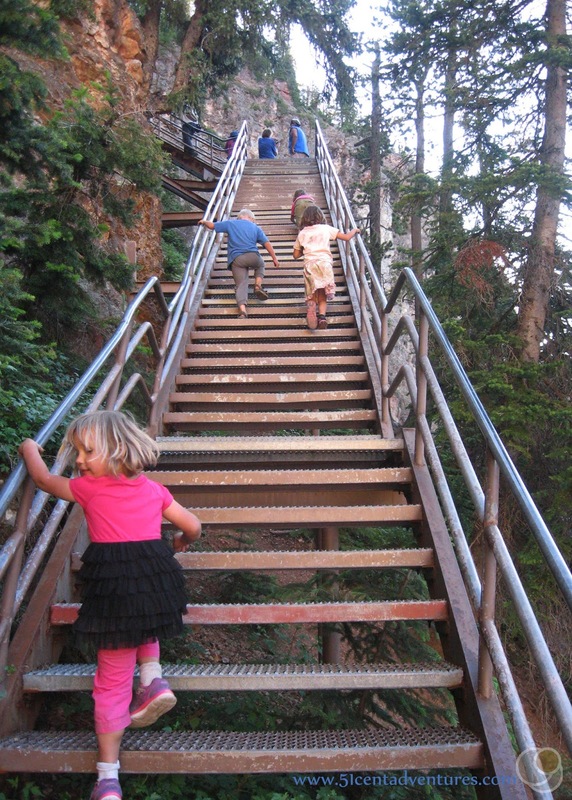 I was pretty certain that the kids could handle the steps down, but I was worried about back up. However, lately they have been stellar hikers and so I was willing to see what happened. 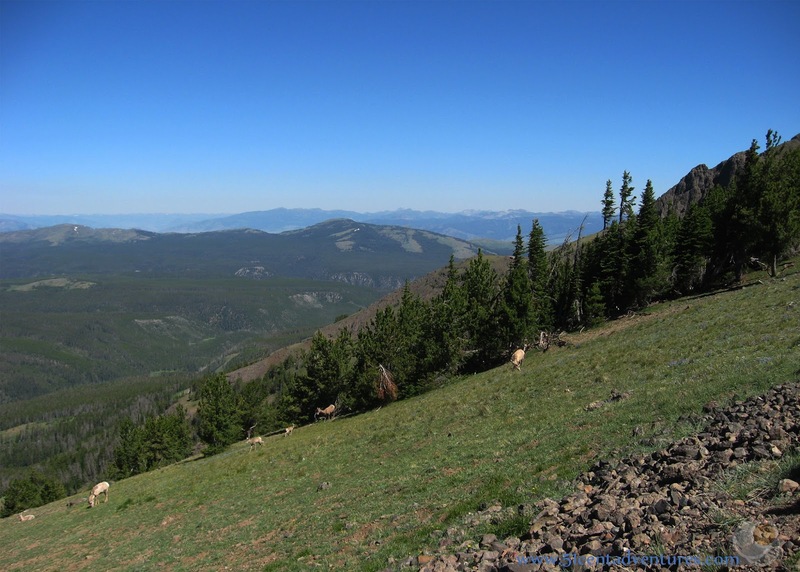 This summer the parking lot for the Uncle Tom's trail is under construction, so we had to park down at Artist Point and then walk along the rim trail to the start of the Uncle Tom's Portion of the trail. 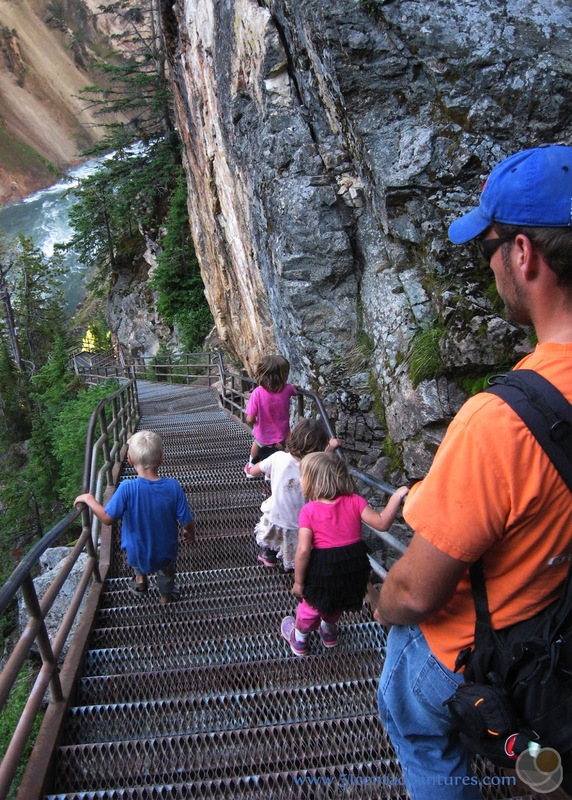 Then we were greeted by the many steel steps down the side of the canyon. 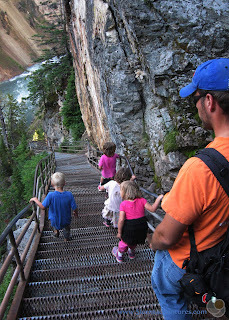 The kids have seen these steps before so they were excited to get to walk on them. This is the only trail in the canyon area that takes you lower than the waterfall. It's really cool to see the waterfall come into view. We reached the bottom and took a victory family picture. If you look carefully at the area above the waterfall you can see some golden specks. Those specks were flying around. At first we thought they were birds, but they were too small to be birds. Then we thought they were some sort of dust, but they were too big to be dust. Finally we realized they were large beetles flying through the air. They were really beautiful. 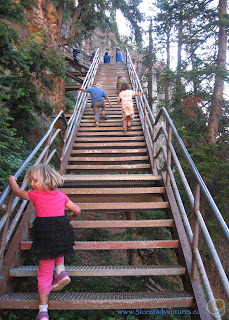 And guess what, the kids did great on the way up. They all climbed up the stairs by themselves and no one asked to be carried. These kids are amazing. My in-laws decided to come up for a visit the weekend after Independence Day. I was able to get them a place in one of the "transient rooms" that friends of Xanterra employees can stay in. The room wasn't much to write home about, just a small room with a bunk bed in one of the employee dorms, but the cost for 2 nights was about 1% of what a one night stay in one of the hotels costs around here so it was perfect. My kids were thrilled to see their "Bestemor and Bestefar" (Norwegian for Grandma and Grandpa) and wanted to know where they were every night. It was fun to show off our tiny house and our big back yard. 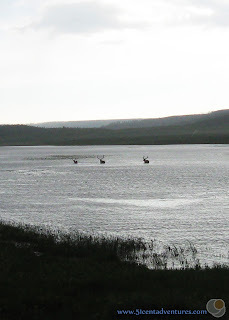 One of our adventures took us through the Hayden Valley just as three elk were taking a swim in a river. You can't plan pictures like this. Another day we took them into the North Eastern section of the park. 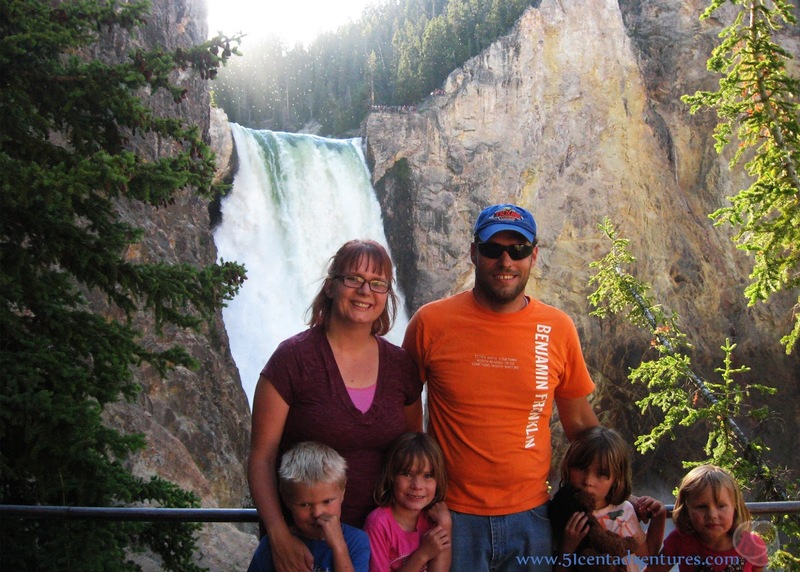 We took them to Tower Falls since they'd never seen that. 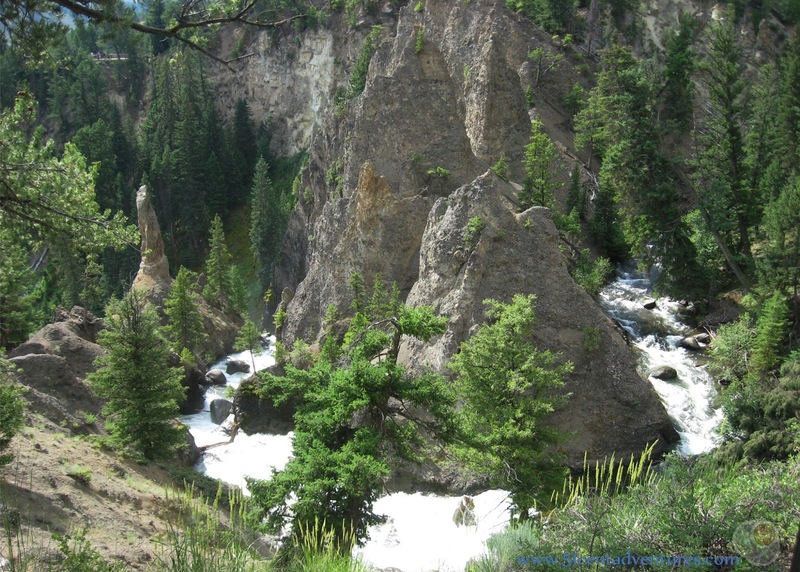 Then we walked around to the other side of the waterfall and looked at Tower Creek as it flowed toward the falls. I think I like this view better. 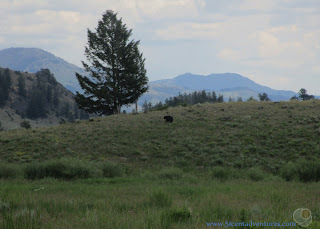 We went into the Lamar Valley and were hoping to spot something cool like a bear or a moose, but saw nothing. That was too bad because my mother in-law has never seen a bear in Yellowstone so we were really hoping to change that on this trip. 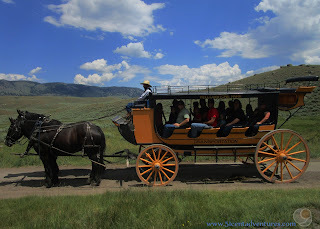 We might have stayed in the valley a little longer but we had to get to the Roosevelt Area where we had a Stage Coach Ride Scheduled. Xanterra operates these Historic looking stage coach rides. They are probably one of the most affordable Xanterra activities in the park. They are $15 for adults and $8 for children. My husband and I were planning on taking the kids on one of these rides sometime this month and we decided it would be fun to do it while the grandparents were in town. I'm glad we planned to do that since my Mother in law has always wanted to go on one of these rides. 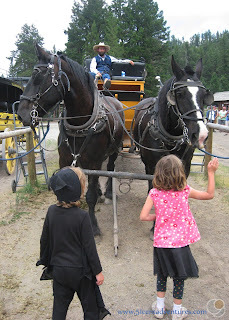 All my kids have been looking forward to the wagon ride, but my son has been the most vocal about it. For weeks he's been asking to go on a wagon ride with horses. (He started out asking to go on a horse back ride, but I told him he had to be 8 before he could do that here.) So everyone was really happy to finally be on the wagon. We were having a grand time riding in the wagon down a dirt road when we noticed there was quite a crowd of cars on the real road. It looked a lot like a bear jam. We realized that everyone was looking in the area that we were about to drive through. We started looking closely for a bear. And suddenly we saw one in the bushes less than 20 feet from us. He disappeared in the bushes so it was hard to get a picture, but when we looked back we could see him climbing the hill. It was amazing. My mother in law was so excited! 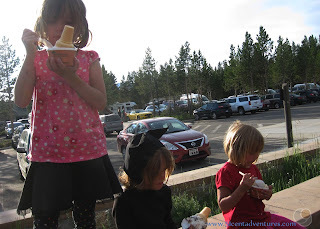 That evening we went to get ice cream at the newly opened Falls Cafe in Canyon Village. I've been promising the kids we'd come try the ice cream as soon as the cafe opened. The ice cream is delicious, but like many things inside the park, horribly over priced. I'm very sorry to say this, but the service is also terribly slow. I can't believe how long it took to get 8 people their double scoops of ice cream. If Subway can make me a sandwich in less than a minute then I should be able to get two scoops of ice cream in less than 30 seconds. And for over $4 those employees should be incredibly fast. But alas, that is not the case and so we will not be going back there for ice cream this summer. The kids were rocking from all the sugar so even though we'd had an action packed day we decided to go take a walk through the Norris Geyser Basin. I never really like Norris, but it's bearable in the evening. It was especially pretty right at sunset. While we walked around I realized what my problem is with Norris. It's a lot like the show room section of Ikea. There is a lot of really cool stuff, but at some point you realize you are trapped in a giant maze with no easy way out. That's the Back Basin Trail in Norris. But my kids love it. I don't know how many times my husband has brought them here while I'm at work, but it has to be a lot because they have it almost memorized. 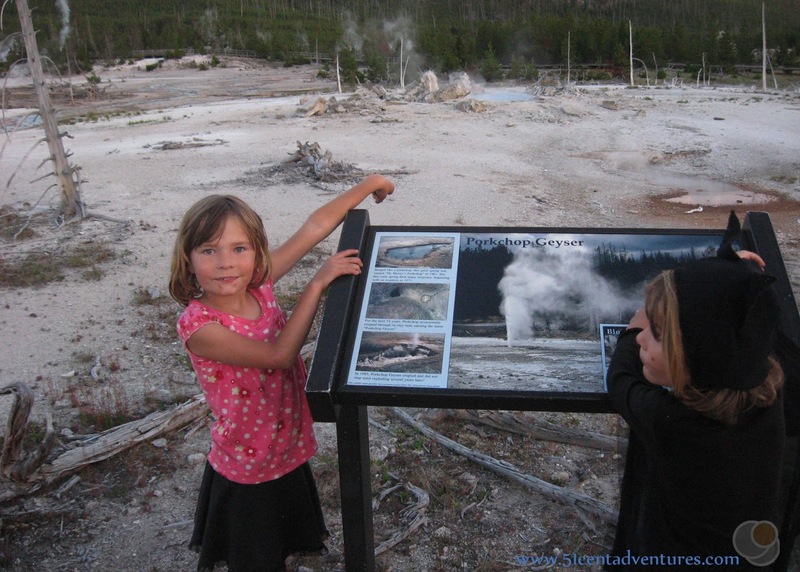 The twins were walking along saying things like, "The next geyser is named Yellow Funnel geyser." and then we'd walk up to Yellow Funnel Geyser. My daughter kept telling me that her favorite geyser is Pork Chop Geyser. 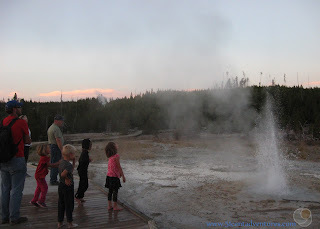 The kids also love Vixen Geyser which they call Rocket Geyser. This is probably the one redeeming feature in all of Norris, because it's basically always erupting. It was quiet when we walked up to it, but the kids sat down by it and said, "wait a few minutes." Within 2 to 3 minutes it started sputtering and then started shooting water into the air. The kids jumped up and down and cheered until it stopped. Then the sat back down to wait again. Their patience was rewarded within a few minutes. The next day I started training for my new position. I was offered this job about a week and a half ago, but I wasn't able to start it until they could find a replacement for me at my original location. That turned out to be harder than expected (what can I say? I'm irreplaceable.) but finally it all worked out. It actually was kind of good that I had to wait the extra time because my new position requires me to commute 4 days a week. And I wouldn't have my own car until my in-laws brought up my jeep. So they arrived with the jeep just in time for me to start training. I'm really excited about my new position - even if sometimes I feel like I bit off more than I could chew. One of the best things about my new job is that now I work four 10 hour shifts instead of five 8 hour shifts. That means I get three days to play in the park instead of two. My first day off was full of grown up things like, driving to Cody so we could register the Jeep and then going grocery shopping. The drive to Cody is always pretty, so it wasn't a complete waste of a day. My second day off was much better. We decided we were ready to tackle the 7 mile hike to the top of Mount Washburn. Now a little bit of history first before I tell you about this. For years I have had a goal to hike to the top of a mountain. Pregnancy and living at low elevations have got in the way of this goal, but I've made some decent attempts. The closest attempt was when we went to Mt Evans in Colorado in 2012. I'd given birth to my son about 3 months earlier so I was in no shape to climb one of Colorado's 14ers. So I cheated and we drove to the parking lot near the top of the mountain and I only had to do the last 500 or so feet on foot. Another cheating summit was obtained last fall when we drove nearly to the summit of Clingmans Dome on the boarder of North Carolina and Tennessee. We'd only had to hike the last 1/2 mile to the top- though I should get double points for carrying my three year old daughter up nearly the whole way. And there were a handful of "mountains" in the south that I climbed. Most notably being "Mt" Bonnell in Austin Texas which rose to an impressive hight of 770 above sea level. I decided it was time to climb on a legitimate trail up to the summit of a legitimate mountain. 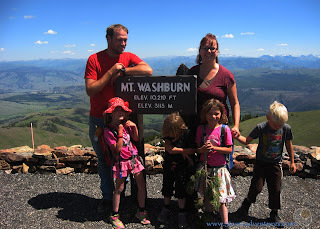 And Mt Washburn seemed like the place to do it. I had my reservations though. 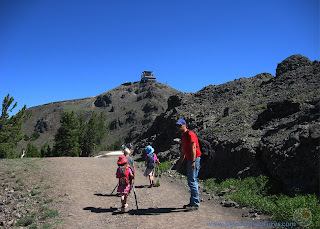 The trip would be a total of 7 miles - which would be the longest hike the kids had been on yet. However, they'd done so well on the gruelingly steep trail to the petrified trees that I was certain they would do fine on the long switchbacks on the Mt Washburn trail. So we decided to try it. The kids did fantastic and it seemed like we were up on the ridge line in no time. (It was really two hours, but they went quickly since no one was whining) We were all really excited to see a few big horned sheep feeding on a steep meadow. And soon we were summiting the mountain! We'd made it to over 10,000 feet above sea level. We'd hiked over 3 1/2 miles and gained 2000 feet in elevation. I was so proud of my little family of hikers. And check out my three year old. There is a big difference between a "just barely three year old" and an "almost four year old." Last fall she insisted that I carry her to the top of Clingman's Dome. 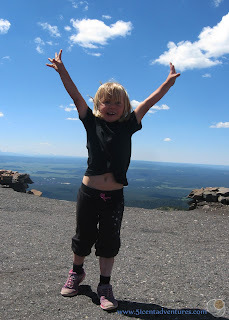 This year she summited a mountain without much fuss. Actually I'm not surprised, this girl is a force of nature and when properly channeled she has enough energy to do anything. There is a small visitor center at the top of the mountain and we ate lunch in there before heading back down. Down was definitely harder than up - but mostly because it was hotter. We kept passing people heading up the mountain who only had a small supply of water. I wanted to go up to them and say, "turn back now or you'll regret it." So instead I'll tell you, don't even consider starting the Mt Washburn trail after noon or bringing just one water bottle. You will have a bad day if you do. We went back to the RV and vegged out the rest of the day. The kids wanted to watch The Martian so we plugged that in. In the evening we roasted hot dogs and marshmallows. We realized the kids were all filthy so we made sure they all had showers before bed. When they finally did lay down in their sleeping bags they fell asleep really fast. And that's good because we have another day of adventure planned for today. I know this summer can't last forever, but every day I catch myself thinking about how lucky I am to have had this opportunity. I really am blessed to have this joy, this life, and this chance.